Use this voucher code to get 12% off large or extra large Rainbow Roses at Interflora. 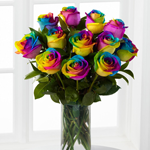 Available to the Rainbow Roses (Code: C01120MS). Minimum product value of £54.99 applies – offer excludes overseas, giftcard and Interflora Gold purchases.